The first baby boomer turned 65 on January 1. Millions more will follow. ABC News has a video report, dissing the boomers in every way: from calling them "demanding" to implying they are only concerned about themselves and their needs. 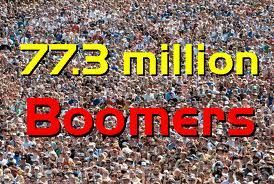 The worst is when the reporter says boomers will soon be demanding social security and medicare, "payable by the generations that came after them."